Clergyman: A man that is born of woman hath but a short time to live and is full of misery. He cometh up and is cut down like a flower. Q: Why does Marley have his chin in a sling? Q: Was the widescreen version that begin airing on TNT HD in 2007 cropped on the top and bottom of the picture? 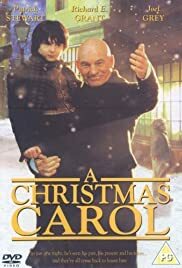 Patrick Stewart demonstrates once again his versatility on screen in this telling of Charles Dickens' classic story. Though most of us(if not all of us) have seen other adaptations in the past or read the story,and know already what to expect,Stewart manages to capture pure magic with his stunningly awesome portrayal of main character Ebenezer Scrooge,and it is definitely worth a look. Special effects add a nice little touch,but it is Stewart's interaction with the 'ghosts' and characters Bob Cratchit among others that really steal the show. A highly recommended film that nobody should miss.....especially during Christmas time!